I’m at the airport in Washington DC after participating in a workshop at tha NIH on dual language learners. We talked about the state of the art. What’s cool is that there has been so much progress. We know that bilingualism isn’t bad for you and that in fact it could be good for you. We have better ideas about how to diagnose bilinguals with language impairment. At least in some languages. We know about what works for Spanish and English. We have emerging data for Mandarin-English and Vietnamese-English as well as other language pairs. We have an emerging picture about bilingual development in two languages. But, there’s still a lot we don’t know. We don’t fully understand how changes in the linguistic environment affect child performance on language measures. We still don’t have a God handle in intervention for bilinguals with langquge impairment. Do we treat in one language or both? Do we use translanguaging approaches? I don’t think we fully understand how bilingualism affects the brain. Nor do we know how the environment shapes the brains of children with language impairment. We heard about reading disorder and mechanisms associated with dyslexia. Children can and do learn to read in two languages but we don’t really understand how those languages interact and how languages that have different writing systems interact in the bilingual brain. Even though we’ve made progress in identification of impairment we don’t do such a great job across languages and at all ages. What is the best way to do intervention with bilingual children with LI? It’s not always completely clear. Bilinguals are bilingual because they need both their languages to function in every day activities. With my colleagues, I’ve proposed for a while that in thinking about intervention we need to think about demands that are unique to L1 and L2 and those that are the same. This notion has been illustrated as a Venn diagram to show what overlaps and doesn’t. 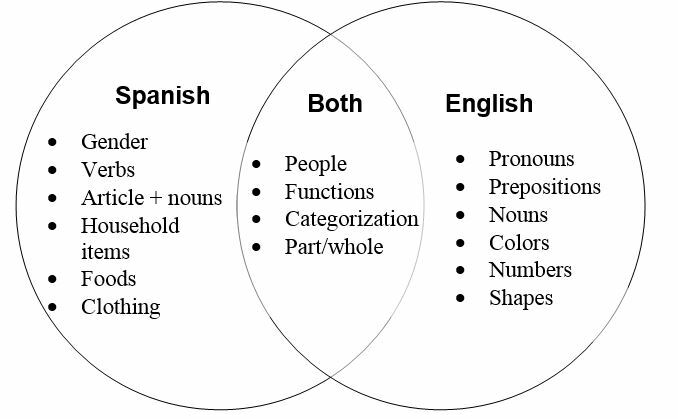 This figure comes from a chapter in Brian Goldstein’s book (now in it’s 2nd edition) where we postulated the kinds of demands a young child might need to meet in the semantic domain in Spanish vs. English. Other important questions are what transfers and what doesn’t? We usually want to maximize learning from one language to another. And we often assume that children can and do transfer knowledge from one language to the other. But how does this happen? In particular, how does this happen in children who have language impairment? I think we can draw on some of the really excellent work that’s been done in bilingual education and in the area of reading. In addition there is emerging work on the topic of intervention with children who have language impairment. We recently published a new paper in Seminars in Language Disorders, “Dual language intervention for bilinguals at risk for language impairment” by Lugo-Neris, Bedore, and Peña. In this paper 6 bilingual (Spanish-English) children with risk for language impairment participated in an intervention study. Three of the children received intervention in Spanish first for 12 sessions then 12 in English. The other three received intervention in English first, then in Spanish on the same schedule. The interventions focused on semantics, morphosyntax, and story grammar using a book-reading approach. Testing in both languages was done at baseline and at the end of the study. Results demonstrated that children made gains in both languages on narratives and in Spanish on semantics. Examination of individual changes by first language of intervention shows some interesting patterns. Children who received intervention in Spanish first demonstrated greater gains in both languages in narratives compared to those who received English first intervention. On the other hand, children who received English first demonstrated greater gains in both languages in semantics while those who received Spanish first showed greater gains in Spanish and limited gains in English. So, it seems that the direction of transfer may be mediated by a combination of the target of intervention and the language of intervention. Of course we need to follow up with larger numbers of children to better understand how language of instruction, the child’s language experiences and the language targets together influence the kinds of gains that can be seen. We’re intrigued and excited by these findings and we hope that these will lead to more careful planning of intervention and selecting the language of intervention to maximize between language transfer. Bilingualism is finally being understood as what it is: a typical, positive and enriching form of living and of communicating in the United States. That is, an asset rather than a deficit. In many cities, dual language programs are flourishing and parents from multiple backgrounds are showing a commitment to bilingual language and literacy development. This is great news; however, there are still some concerns about bilingual education and bilingual children with language disorders. Are these children able to learn in a dual language classroom? Will they feel overwhelmed and confused? Will they manage to learn English? What should we recommend their parents? We can now make some recommendations based on recent research conducted with Latino Spanish-speaking preschoolers with language impairment (Gutierrez-Clellen et al., 2012; Restrepo et al., 2013; Simon-Cereijido et al., 2013). And the recommendation is definitely bilingual! We found that the Spanish-speaking children with language disorders learned new English words and increased the length of their English phrases at a faster rate from interventions in Spanish and English, rather than in English only. Moreover, they also showed gains in Spanish. In a separate study, we collaborated with Head Start teachers who taught our lessons in small groups to bilingual children with and without language impairment (Simon-Cereijido & Gutierrez-Clellen, 2014). All of the children, regardless of ability, made more progress than the bilingual children who did not receive the lessons and who were instructed in English only. Thus, a bilingual approach proved to be more beneficial than an English only approach for the children with language impairment. This intense vocabulary and oral language intervention was developed following quality preschool evidence-based practices combined with a bilingual approach. Units of four 30-minute lessons were designed around bilingual picture books and every unit introduced the storybook, the new words, and the games in Spanish, the strong language of these children. The children, then, were ready to listen to the same information in English the following day. Days 3 and 4 alternated the languages. We explicitly designed several hands-on activities to repeatedly teach new, less frequent vocabulary (a weakness found in a great number of typical and atypical Latino children). We also designed “Talk and Play” games to facilitate the production of longer utterances. The “Talk and Play” activities used themes from the storybooks, familiar words, and a few toys that would allow the children to take “speaking” risks in a playful environment. There is still much more to figure out about interventions and programs for bilingual children with language disorders. However, we do know more than before, and we should feel more and more confident to support bilingualism at home and at school. This is the title of Alexandra Sabater’s post in the Dallas news opinion blog. She writes eloquently about the benefits of bilingual education from her perspective as a teacher. It got me thinking about beliefs about bilingual education for children who have language impairment. In a recent post, I discussed the therapy goal driving the language of intervention and not vice versa. In Part 2, I provide an example focusing on speech sound disorders and some more explanation. Suppose you determine that a Spanish-English bilingual child has a speech sound disorder in which the trill-sound in Spanish (in a word such as “perro”–dog) and the r-sound (as in “read”) are misarticulated. The goal drives the language of intervention. If you want to remediate the r-sound, you are obligated to do so in English. Only English has that sound-not Spanish. The same is true, of course, for the trill sound in Spanish. You must work on it in Spanish. Clearly, these are somewhat easy cases and easy decisions. What happens with a sound such as the s-sound, if it is misarticulated in both languages? By the way, if a bilingual child has a disorder, it will occur in both languages, not just in one language (a topic for another post). So, back to the misarticulation of the s-sound in both languages. The goal (and my bias) is to increase the accuracy of that sound in both languages ultimately, but how should this be done? At this point, language of intervention is relevant. Holm, A., & Dodd, B. (2001). Comparison of cross-language generalisation following speech therapy. Folia Phoniatrica et Logopaedica, 53, 166-172. Holm, A., Ozanne, A., & Dodd, B. (1997). Efficacy of intervention for a bilingual child making articulation and phonological errors. International Journal of Bilingualism, 1, 55-69. Ray, J. (2002). Treating phonological disorders in a multilingual child: A case study. American Journal of Speech-Language Pathology, 11, 305-315. Although these studies provide some direction for us, they are all case studies, and thus, we can’t generalize them. That being said, we do need to find some direction. The numerous factors that the students raised (and that were also included in the previous post) come into play: home language, parental choice, use, proficiency, dominance, school language, language of the speech-language pathologist, and availability of interpreters/translators. At this point, we don’t have research evidence that privileges one approach over the other. However, regardless of which language you start in, it is critical to monitor how that skill is generalized to the other language. If it generalizes, then theoretically you would not have to work on it in the other language. If it does not generalize, however, it would be appropriate to target it in the other language as well. Again, the goal drives the language of intervention with the ultimate outcome of raising a bilingual child who is a competent speaker of both languages. Kohnert, K., Yim, D., Nett, K., Kan P.F., Duran, L. (2005). Intervention with linguistically diverse preschool children: A focus on developing home language(s). Language, Speech and Hearing Services in Schools, 36, 251-263. Gutiérrez-Clellen, V. (1999). Language choice in intervention with bilingual children. American Journal of Speech-Language Pathology, 8, 291-302. Goldstein, B. (2006). Clinical implications of research on language development and disorders in bilingual children. Topics in Language Disorders, 26, 318-334. I opened the discussion with an open-ended question, “what is the first question you need to ask yourself in planning treatment for bilingual children with communication disorders?” Each and every student said something like, “What language should I treat in?” We then discussed how to make that decision. They raised a number of factors that would be important to know in making that decision such as: home language, parental choice, use, proficiency, dominance, school language, language of the speech-language pathologist, and availability of interpreters/translators. In discussing this topic for almost an hour, we could not agree on exactly how to answer this question. I then told them the truth. There was a reason they couldn’t truly answer the question. It’s the wrong question (initially). Said another way, it’s the right question but at the wrong time. I then asked them if the child were monolingual, what would be their first question. They all said, “What’s the goal?” Then why, I asked, is that not the same question for bilinguals? Silence. Language of intervention is, of course, an important and critical question to answer in working with bilingual children, but I don’t think it’s the first one. Determining the goal drives the language. Language of intervention does not signal the goal. In a future post, I will provide more detail on this notion and give you an example.